The aim of this study was to evaluate midterm results after hybrid stabilization of unstable osteoporotic fractures of the thoracolumbar junction. This retrospective study was performed at a level I trauma center. 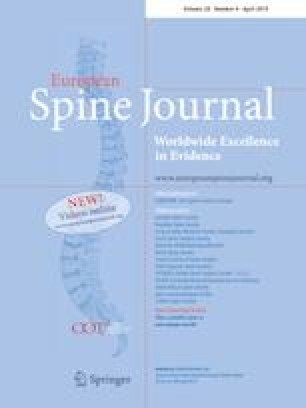 A total of 113 patients aged 61 and older were stabilized using hybrid stabilization consisting of short-segmental posterior instrumentation and augmentation of the fractured vertebral body after suffering an unstable osteoporotic vertebral body fracture at the thoracolumbar spine. All patients were treated by hybrid stabilization. The primary outcome parameters were the ODI score and loss of reduction. Secondary radiological outcome parameters were the sagittal alignment parameters. Seventy-two women and 41 men (74.6 ± 6.8 years) were included. Sixty-nine patients (61%) were re-evaluated after a mean of 48 months. Seventeen patients have died during the follow-up period (15%). A total of five in-patient complications were documented (4.4%). Additionally, 12 patients (17.4%) suffered from further osteoporotic vertebral body fractures affecting vertebral bodies of different levels. The average ODI score at the final follow-up was 29.9 (± 22.0). Thereby, 66.6% of all patients had low to moderate limitations. The average regional sagittal loss of reduction was 7.4% (± 5.6%). Loss of reduction was below 10° in 78% of the patients. There were statistically significant correlations between the loss of reduction and the ODI score, pelvic incidence and latest Cobb angle, and between the ODI scores and the lumbar lordosis. The majority of patients had low or moderate limitations and low to moderate reduction loss. Thereby, high loss of reduction correlated directly with inferior outcomes. The online version of this article ( https://doi.org/10.1007/s00586-019-05957-8) contains supplementary material, which is available to authorized users. This work was not supported by any external sources of funding. Two of the authors are in advisory boards of companies, C-EH for Fa Medacta, CJ for Fa Zimmer, Fa. Ziehm and Fa. Silony. Additionally J-SJ received horonary for speaking from Fa. Ziehm. Two aurthors (UJS and C-EH) received material supply for biomechanical testing by Fa. Medacta.